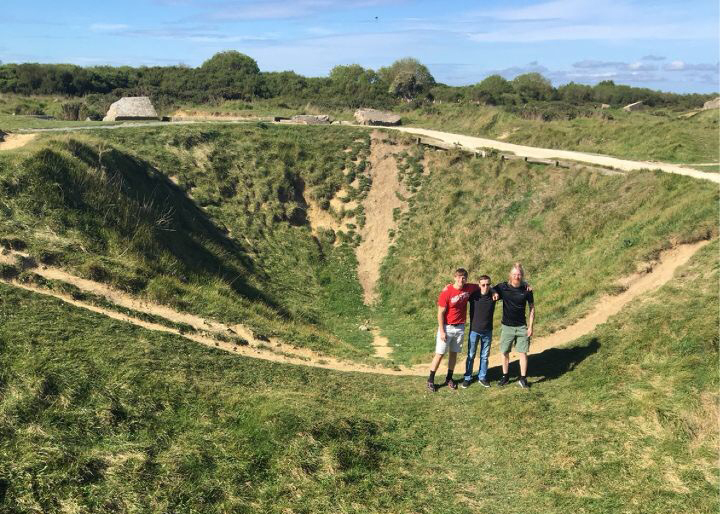 Intern Nathan Byrne (right) stands in front of a bomb crater at Pointe du Hoc in Normandy, France. Hello, all! My name is Nathan Byrne, and I’m an intern at WOSU Public Media. For the past several months, I’ve been assisting Columbus Neighborhoods with research for upcoming episodes that feature stories with a Central Ohio tie to the Vietnam War. Ken Burns and Lynn Novick’s 10-part PBS documentary series The Vietnam War is airing on WOSU TV through Thursday, Sept. 28. Then, the new season of Columbus Neighborhoods kicks off at 8:30 p.m. Thursday, Oct. 5 on WOSU TV, with the first of two episodes dedicated to the Vietnam War. 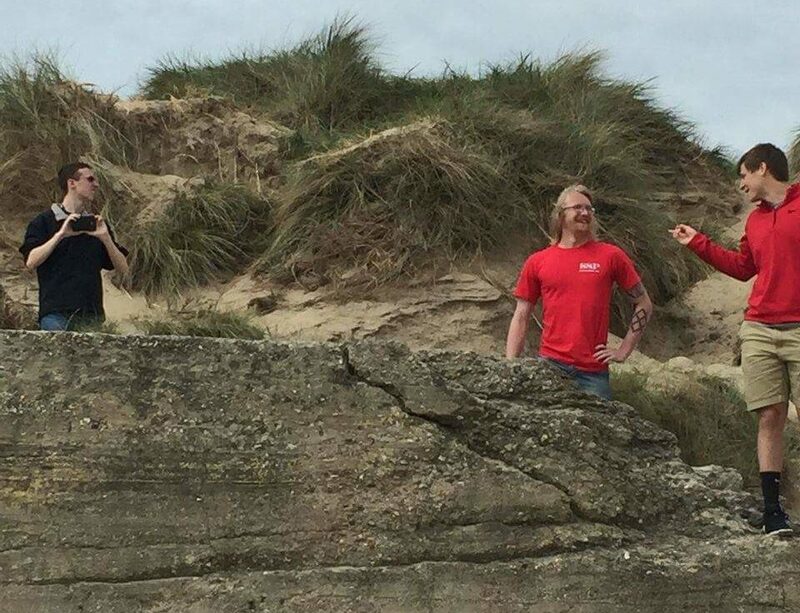 I’m a third-year student at Ohio State University, majoring in military history and minoring in Scandinavian studies. I hail from a small village in northwest Ohio called Cloverdale, with a population of roughly 100 people. I became interested in history as a high school student. My school didn’t put a big emphasis on history—my history classes mostly involved reading along to a textbook and watching movies. So I would often do research on various wars, cultures and peoples on my own, outside of class. I’ll also admit that watching the TV show Stargate SG-1 and the various antics that Daniel Jackson and company got into inspired me to research ancient history. I was initially torn between studying ancient history and military history. I settled on a military history major and a minor in Scandinavian studies to learn about ancient Scandinavian history because of my Swedish ancestry. I became interested in military history because I am curious as to why different conflicts happened, what caused them, how they could have been prevented and the resulting aftereffects on global and local scales. The Vietnam War is particularly interesting because of the various factions involved, and how the world powers interacted throughout a conflict in southeast Asia during Cold War conditions. I found out about the opportunity to work with WOSU on this project while I was studying abroad in Europe, with a focus on World War II history. I was visiting Britain, France, Poland and Germany with a student group when I received the notification of the position opening. 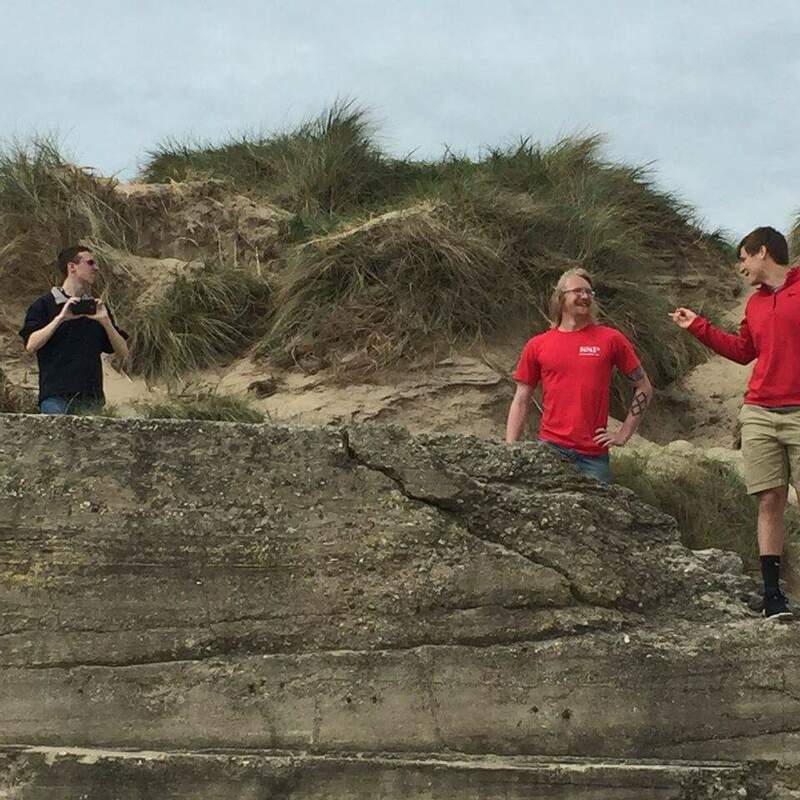 Intern Nathan Byrne (middle) visited the beaches of Normandy, France, during his studies abroad. Throughout my internship, I have been conducting various kinds of research for WOSU on how Columbus was affected by the Vietnam War and how the people of Central Ohio responded to it. For example, I learned about “counter” protests, during which people showed their support of the war and disdain of the anti-war protests. It was interesting to find that a group of Cuban refugees showed their support of the war in a demonstration at the Ohio Statehouse. It’s been fun going through countless rolls of newspaper microfilm and searching through databases, looking for any relevant information that may shed further light on the subject. I’m thankful for the opportunity to work with WOSU on this project, and I hope you will enjoy the stories we’ve uncovered! Thursdays this fall, tune in to WOSU TV at 8 p.m. for stories that make Columbus an extraordinary place to live. Explore the robust local arts scene with Broad & High at 8 p.m. Then discover the people, landmarks and history that have shaped our city with Columbus Neighborhoods at 8:30 p.m. New seasons begin Thursday, Oct. 5 on WOSU TV! This entry was posted	on Monday, September 25th, 2017 at 3:44 pm	and is filed under Blog, Story. You can follow any responses to this entry through the RSS 2.0 feed. Both comments and pings are currently closed.